Above ground pool options have come a long way, and at Blue Dolphin we offer you quality manufacturers to choose from. Available in more shapes and sizes than you can imagine, in-ground pools can be customized to suit your very unique style and accommodate your every need. Ideal indoors and outdoors, a spa adds the ultimate in relaxation, rejuvenation, and even rehabilitation to your home. Spas are the perfect option if you are looking to soothe tired aching muscles, relieve stress, and promote relaxation. 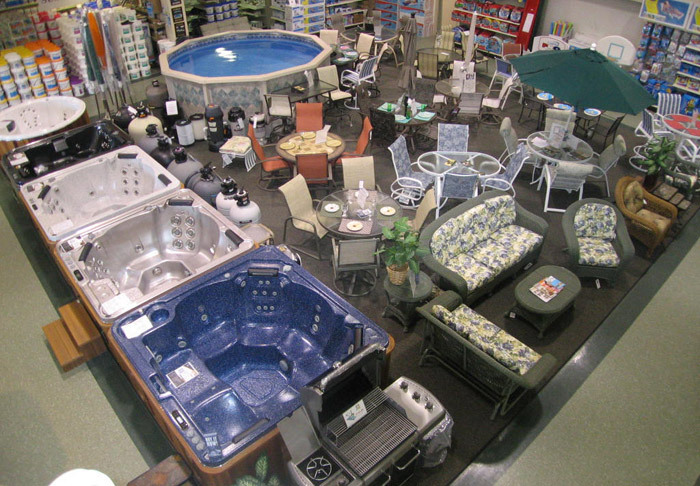 Blue Dolphin Pools & Spas carries options to fit your style and budget. Put the sizzle back in your BBQs with a new grill for the patio or deck! However big or small, gas or charcoal, portable or stationary, Blue Dolphin offers a variety of options for tasty grilling. What's a pool without a filter, floating lounge chairs and beach balls? Or a patio without fun, outdoor dinnerware? And a pool without a vacuum – let's not even go there! When it comes to chemicals for your pool or spa, it pays to work with an experienced dealer who can assist in the proper selection and application. A clean and safe pool is important. At Blue Dolphin, our sales and service staff are well versed in the various products and manufacturers and are always available to assist you in-store and on-site with your chemical product needs.